Another tea-for-one set, this one based on a little fairy garden house I made over the summer. This was a special request Christmas gift. The teapot is functional, but will likely be added to a decorative collection. The teapot has an added ring on the bottom to keep it from sliding off the cup, and also to give it a little lift off a tabletop. The cup was a lot of fun with its wood grain and fairy house adornments. 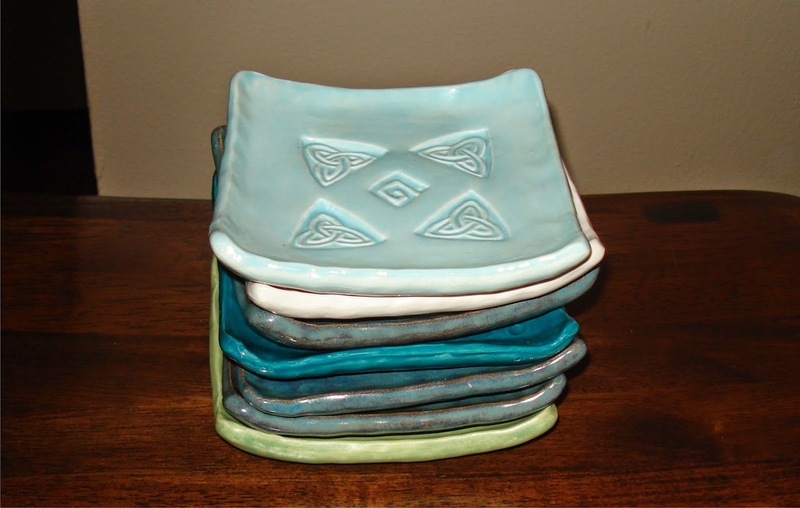 The glazes are Cuerda Seca by Laguna Clay. I really like the color variation and satiny finish. soft green with brown streaks. with black “ink” before the glaze firing. So it turns out people really like yarn bowls. Sure, they’re useful – they keep the ball or cake of yarn from bouncing all over the floor and being attacked by the cat while you knit or crochet. And they’re decorative too. This functional set was made as a housewarming gift – garlic jar, utensil crock and sponge holder. The pieces are wheel thrown with Laguna white clay and glazed with a combination of Mayco glazes, using a black “ink” for the fine detail. The gear imprints are made with our handmade clay stamps. I envision making similar pieces in a variety of colors including midnight blue, violet and caramel. After much experimenting and testing on our friends and family, we have a companion product to our pottery: Clay soaps. We’re really happy with the results and they have been well received. which everyday hand soap did not help. that soothe, detoxify and nourish the skin. to add clay to our soaps, so we tried it. We loved the results, and hope you do too! clean feeling, and also help to soften and protect the skin. 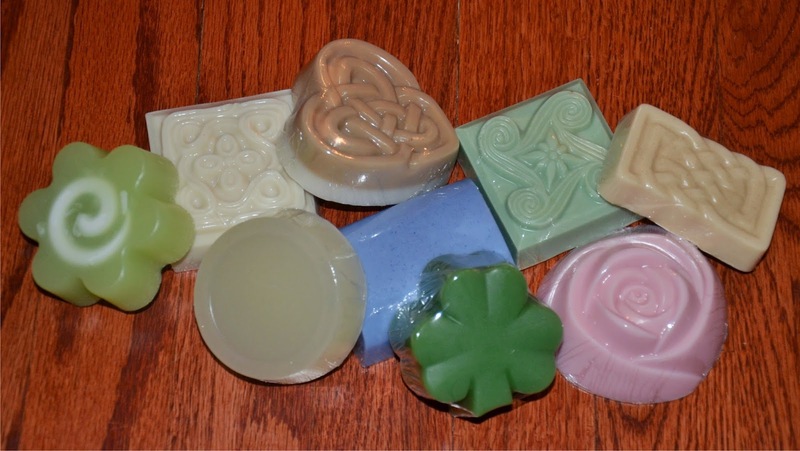 We offer our soaps in a wide variety of shapes, sizes, colors and fragrances. This set was a special request for a teapot, teacups with matching plates, sugar & creamer set in black with white swirls and an occasional rose. Pretty happy with the outcome. Unlike a lot of what we do, this was done with a full cover of black, with the white and red added over the top (all Mayco colors). The clay is Laguna B-Mix Cone 5. Thanks, Q, for the photos! Copyright © 2019 Barbara Hill. All rights reserved.